Happy Friday the 13th everyone! If you celebrate by enjoying some horror movie fun (might I suggest the 1992 classic, Army of Darkness? ), you're going to need to scrub all that fake blood off with some good soap... Or perhaps just use the soap to get the popcorn smell off your fingers... Luckily, I'm here with another awesome cover for SOAP DISPENSER WEEK 2012!!! 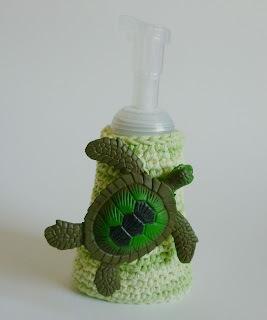 Today's soap dispenser cover is for my mom, because she requested one. Her favorite color is green, and she loves turtles, so that's why we're doing this today. I wish that there was more to it than that... but there isn't. LOL!!! If you'd like to add a toy turtle to the front of your soap dispenser as well, I hot glued two bobby pins between two circles of felt, and then attached them to the underside of the turtle, making sure that the bobby pin by the turtle's head was in line with it's neck. 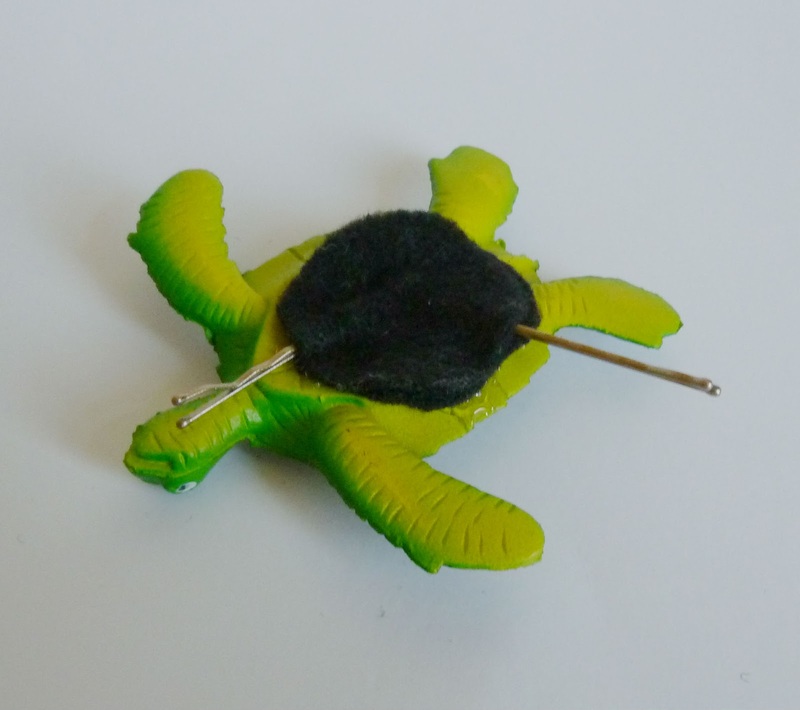 Once the glue cooled, I slid the bobby pins in between the crocheted stitches of the cover to attach the turtle. This way, it's easy to remove, but the turtle won't just fall off onto my mom's kitchen counter. I wanted to talk just a little bit about foaming hand soaps. I adore them. That's all we use around here. But they can get a little pricey, since (for my family) they don't seem to last as long as the bottles of non-foaming soap. Plus, until Bath & Body Works has some sort of return/recycling program, it just kills me to throw the barely used empties away (even if it's in the recycling bin). I was browsing on Pinterest the other day and ran across a link to this post about how to make your own foaming soap refills (btw, Stephanie at Full of Great Ideas really is full of great ideas. Someone called her the Mythbusters of Pinterest, and I have to agree!). Anyhoo, I thought that I really should pass along the 'recipe' (which I have since seen on several other blogs too!) and maybe we can all save a few bucks. Everyone in blogland seems to be in agreement that you should aim for a 2:1 to 3:1 ratio of water to liquid soap. Some suggest using hot water. Lots of people use yummy smelling expensive soaps, since it makes them last longer. Other people use dish soap, and shampoos. I am especially interested in the dish soap idea, since I think the extra yuck-removal power that those cleansers have might be beneficial for my family, particularly in the kitchen. Everyone agrees, do not get creamy non-clear soaps since they will clog up your foaming dispenser. I refilled one of my old Bath & Body Works dispensers with B&BW's Pink Chiffon-scented body wash, with fantastic results. I filled the bottle about 1/4 of the way with the soap, and then filled the rest of the bottle with hot tap water. I gently swirled the bottle until the soap was mostly mixed in, but I wasn't too worried, since I know that eventually it will dissolve. It works perfectly, and I am really happy, since it isn't a fragrance that they offer in their hand soap line (and it is currently my signature scent!). So, I feel spoiled and happy, and I don't feel guilty that my empty foaming bottles are going to waste anymore. Have a happy Friday, Dynamos! Come back tomorrow for Day Six of soap dispenser goodness! Piper, your comments make me so happy! I am so glad your found my site, and I'm glad you're my friend! I too am glad, you are a wonderful lady. Ahahahaha! Good question! Sorry you got stuck. It doesn't go to 16 stitches. It stays at twenty. Thanks for catching my mistake.